Robert Bly isn’t just a master when it comes to making a living as a freelance writer (over $600,000 a year annual income), but he’s an amazing teacher. He’s written over 100 articles and 70 books and speaks at numerous conferences. In this revised edition of Getting Started as a Freelance Writer, he covers issues important to writers at every stage of their career. This book is valuable for someone exploring the possibility of becoming a freelance writer, for someone beginning a moonlighting career, as well as the more experienced writer trying to maximize her income potential. There are sections on how to set up a business and a office. There are also invaluable tips on finding work assignments and insight on how to increase your income. Bob is also candid about common mistakes and pitfall to avoid. He shares his insights on how to avoid time wasters, like managing email and internet time. With this book in hand, there is no reason for any freelance writer to waste time re-inventing the wheel. I bought this book when it was first released in 2006 and it’s dog-eared with use. I also bought the revised edition and it’s beginning to look as well loved as its predecessor. I highly recommend it to anyone who’s serious about a career in free lance writing. Don’t forget to join the conversation! It's that time of year again. Writing conferences are gearing up, the faculty has been chosen and the websites are humming, ready to take your reservations. So why attend a writer's conference? Is there anything to be gained? I believe the answer is an unequivocal yes! I’ve personally been attending large conferences for 10 years and smaller ones even longer. And even as my experience level has increased, so have the benefits from attending. Here are my top ten reasons to attend a writer’s conference. 10. Relationships. Writing is all about relationships – your relationship with the reader, with the editor and with other writers. 9. Loneliness. Writing is a lonely business. We need time to socialize with others who get this crazy passion we have with words. 8. Confirmation. We all face doubts as to whether or not we really are a writer. A conference is the best place to confirm that calling and receive support from our peers. 7. Misery loves company. If you have spent any time at all as a writer, you know all about rejection. It helps to hear other people talk about their experiences and realize we all face the same thing. 6. The classes. Where else can you spend hours at a stretch learning about all the different aspects of writing? 5. Late night brainstorming sessions. Many of us keep odd hours as writers, where else can you find others ready to share a cup of coffee and discuss an idea at 2am? 4. Meet your neighbor. Okay, I admit, this one’s personal for me. But I had to go to a writer’s conference (Blue Ridge Mountain Christian Writer's Conference) to meet my writing buddy and critique partner,Vonda Skelton – who lives less than 3 minutes away! 3. Hang out with the stars. We all have writers we admire and a conference where they are on staff is the perfect place to get to know them. 2. Sharpen that pitch. If you want to pitch an idea, a conference is the perfect place to try it out on other professionals before you send it to the editor. 1. Network, Network, Network. Like I said, writing is all about relationships and its human nature for an editor to prefer someone he’s met to someone he doesn’t know. This year, I'll be on staff at several writing conferences. If you find your apetite whetted for a writing conference, another good resource is Shaw Guides. I hope to meet you in person! Every Thursday I'll be posting a review pertaining to writers. It may be a review of a book, software, online class or conference relevent to the writing industry. Sometimes we'll talk about fiction, other times we'll discuss non-fiction. Our goal - to help each other become better writers. I'm inviting you to join the conversation as well. Let me know what you've discovered to help you. Ask for the help you haven't been able to find. None of us has all the answers alone, but when we band together we're unstoppable! Writing publishable fiction takes the planning and preparation of an invasion campaign. From fighting self doubt to navigating the mine fields of the industry itself, victory can seem unattainable. As a successful novelists himself, Jim Bell knows that battle first hand. 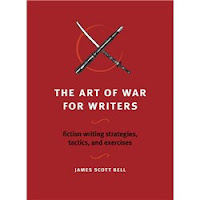 His newest book on writing is a work packed full of practical strategies and focused exercises, guaranteed to equip any writer for the conflict ahead. This small book, written in digestible bites, translates Sun Tzu's "The Art of War" into an indispensible handbook for novelists. Personally, I keep James Scott Bell’s other books on writing within easy reach in my office, where they show signs of being well used. I know this latest release will join them. I recommend it wholeheartedly to aspiring and veteran novelists alike. So many writers I talk to struggle with finding regular work. Occasionally that has to do with their lack of effort, but most of the time it has to do with not knowing how to multiply their efforts. There are lots of ways writers can multiply their efforts, from selling reprint articles, to re-purposing existing articles as well as building a web presence. This week I’ll discuss building a web presence. Building a presence on the Internet sounds difficult and time consuming, but with the advent of social networking and today’s technology it’s becoming easier and easier. One word of caution, don’t spend so much time on web presence that you have trouble finding time to write. Here are some simple ideas to help anyone get started. If you are a book writer, consider a fan page. Otherwise, sign up for a personal account and post to it regularly in regard to your writing. Even if it’s just a quote, it keeps you in front of the public. Warning: It’s easy to get caught up in the Facebook world so I limit my visiting hours to 3 times a day. Once in the morning, once in the afternoon and once in the evening. Again, sign up for a personal account. Look for friends who also have twitter accounts and sign up to ‘follow’ them. People are usually good about reciprocating when you follow them. Warning: Just because someone follows you, it doesn’t obligate you to follow them. Choose wisely and keep your focus in mind. You’d be amazed at how much interest I get from this simple blog. Find something you enjoy writing about and share it regularly through a blog. Warning: It is important to keep your blog posts on a regular schedule. If you tell people you’ll have a new post every Monday, don’t be late, you won’t often get a second chance. This refers to the way you sign your emails and actually takes up several lines. In any email program it’s possible to set up a standard signature line that shows up on every email. Be sure you take advantage of this option. What goes on a signature line? Warning: Keep your signature line to a maximum of 6 lines. Anything more and people lose interest. With all these options anyone can begin to build a presence on the web. Coming on Thursdays, starting this week, I’ll begin reviewing writing books, software and conferences. In years past, the emphasis with writing was simply that—writing. Now, as our society has become more and more visual we, as writers, must also evolve. This is especially true on the Internet. We must broaden our horizons and become designers. Trends and statistics are clear; in less than 5 years 85% of what is viewed on the Internet will be video. If your text is longer than 1-2 printed pages, try to break it up into separate web pages. It’ll be easier to read and the pages will download faster, especially if the user has a dial-up connection. Avoid a busy background or frame. Consider contrast between text and background. Although white is a good background color, consider a shade that is barely off-white as this is usually easier on the eyes. Choose your font wisely. Times New Roman isn’t a good choice for reading on the computer. Arial, Helvetica, Verdana and Georgia are better choices. Also take into account font size. As writers, we often view our words within a box, or at least our minds. We don't pay attention to the whole picture. We can no longer afford that mindset. When writing for the web, we have to educate ourselves. Often writers will be consulted, or at least asked to voice an opinion. Here some suggestions to make you a more savvy content writer. Look at the web pages you go back to and make a list of what catches your eye. Look at web pages that frustrate you and make a list of your frustrations. Notice what entices you when you're reading a magazine article. I hope this series has helped, next week we'll begin a conversation on how to build your web presence. Don't forget to join the conversation! If you've spent any time writing content for the web you've run across the acronym SEO. This stands for Search Engine Optimization. It's basically where in the list of millions your content will show up when searched by a reader. If you use different search engines - google, yahoo, etc., you'll notice that each will give slightly different results from any given search. But there are things we can do as writers to move our content up in the rankings. To accomplish this we have to have a basic understanding of how SEO algorithms work. Search engine algorithms take words literally. This means that they don't understand it when we make a play on words. For example, a recipe titled, Too Hot To Handle Chili will rank lower than one titled, Homemade Vegetarian Chili. Often times a clever title will result in fewer clicks. This doesn't mean we can't be clever - only that we have to be deliberate in where we're clever. Take that chili recipe, give it a title that can be searched literally, but describe it as Too Hot to Handle. Search engine algorithms also look for keywords. Keywords are the words that appear on the website that describe that page. When writing content for a client they will often give you a list of keywords. It's your responsibility to use those keywords effectively. This is called Keyword Density and refers to the number of times a keyword is used on a page. Search engines read from the top of a webpage to the bottom, searching to see that important keywords are used throughout the page. It's important to have a high concentration of any given keyword at the top of the page and then spread out evenly throughout the rest of the page. These are just some of the basics of SEO that content writers need to be familiar with. Click on the Tabs Below for More Information! The Write Conversation is a Winner! 1. Prepare for the conference—an overview of what you’ll need. 2. The Pitch—Get ready to talk to other industry professionals about your work. 3. The One Sheet—Put together a professional presentation. 4. Your Writer Bio—Make sure you have a relevant bio for your one sheet and proposal. 5. Make an Appointment—Know what to expect during an editor/agent appointment. 6. Keep it Together—Get organized so you’re ready for anything. 7. What Not to Wear—Know the dress code to stand out in the right way.